"Courteous & helpful staff, nice work. Good, clean & tidied up which is most appreciated." “I am thrilled with the trades. I have had plasterers in before and they have always made a mess but the Artexer and Decorator kept the place clean and tidy. They were also polite, hard working and did a great job”. “I would like to thank you and your colleagues for providing us with a courteous and professional service during the carrying out of the work. The standard of supervision, quality of workmanship and general client awareness was excellent." 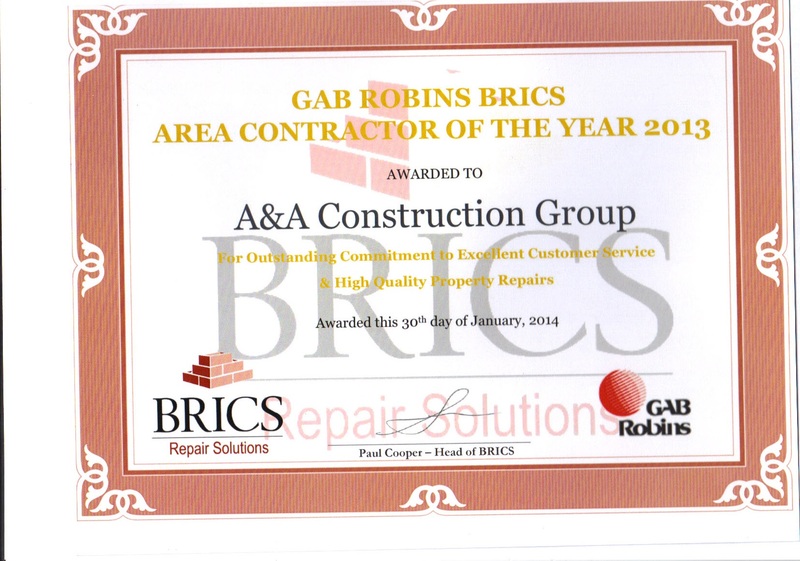 A&A Construction Group is a Repair Network Supplier for Insurance related repairs to properties. Our business deals primarily with Insurance repairs so is set up to precisely deal with this industry. With over 12 years experience within the Insurance industry working alongside top Contractor Management companies, Loss Adjusters and leading Insurance Companies, our team use this experience to provide a premium service to both Insurers and customers, making an insurance claim process as stress free as possible without compromising quality of workmanship. A&A Construction also undertake contractual maintenance and refurbishment works for local authorities, housing associations and architects and have earned an enviable reputation in these fields. We have a large fleet of sign written vehicles, of which all contain tracker systems to enable easy location of all trades. All employees are recognisable wearing our logo work wear or uniform and carry Identification. A&A Construction Group has been established as a business for over 32 years. Starting out as a small company specialising in roofing, it has progressed to be a modest sized insurance repair and restoration specialist, also carrying out maintenance and small works contracts. Commercial and Domestic Case Studies, Subcidence Repairs, Fire & Flood Restoration, Coverage and Recent Testimonials. Here at A&A Construction we take great pride in selecting the correct candidate for the appropriate position. Whether this is on the field or within the office, we will only select highly skilled, well presented and ethical professionals whom have uncompromising standards in both their attitude to work and in practice. A & A does it again! A&A CONSTRUCTION © 2012 | All Rights Reserved.